AzCorp Entertainment was created to provide meaningful & entertaining storytelling with embedded civics, social justice and gender equality themes. AzCorp’s vision is a relatable universe of heroes and villains that come alive through thought-provoking stories, that prompt dialogue, instill critical thinking, evoke social consciousness, and compel positive local action by its readers. AzCorp lives and breathes within the space of edutainment and aspires to engage kids, teens and young adults as their primary audience. Where adults fail, teenagers take charge. Sheeba and the Private Detectives – is a series featuring four friends that love education and are determined to challenge illiteracy and ignorance against all odds. With adventures intended to appeal to children ages 8-13, these young heroes travel all around Pakistan in search of local ‘mysteries’. Armed with books and the support of their fearless pets (Janbaaz, a dog of mixed origins) and (Tufaan, a temperamental donkey) – Sheeba, Reemi, Majid and Qulsoom use familiar principles of science, math and a dose of common-sense sleuthing to solve the gravest of community conundrums. The first two books in the series will be launched in summer 2018. Team Muhafiz brings together 10 multi-ethnic, interfaith adolescent heroes at a local ‘youth centre’. Together, they combat villains that embody present-day, local-level injustices, radicalism, and key social, economic and development challenges. Team Muhafiz stories to date bring the sensitive and difficult concepts of environmental degradation, especially deforestation and unchecked urban development, child rights, especially child marriages, corruption, and violence against women to the consciousness of young people across Pakistan. Interspersed with the content are activities and actions that encourage youth to ‘get involved’ in making a difference. Team Muhafiz was shortlisted as the Official Nominee for National Innovation Award 2015 in Art & Design category by the Pakistan Innovation Foundation. Mein Hero/I Am A Hero is AzCorp’s latest initiative for the youths of Pakistan. Combining interactive class-based sessions with grass-roots local ‘superheroes’ AzCorp is furthering its vision of Team Muhafiz with the help of students who develop a ‘hero’ storyline – combining narrative, values, problem-solving and story-writing skills – while understanding local-level issues and the importance of individual action. Selected stories will be converted into comic books and adapted as theatre plays as well as for broadcast via radio. Through this initiative, AzCorp will celebrate heroes from all parts of Pakistan, who already represent the spirit of selflessness, compassion and justice for all, irrespective of race, religion, creed, ethnicity or colour. This amazing journey will also be chronicled in a short documentary. Pilot activities with schools in Lyari, Shireen Jinnah Colony and Malir started in May 2016. 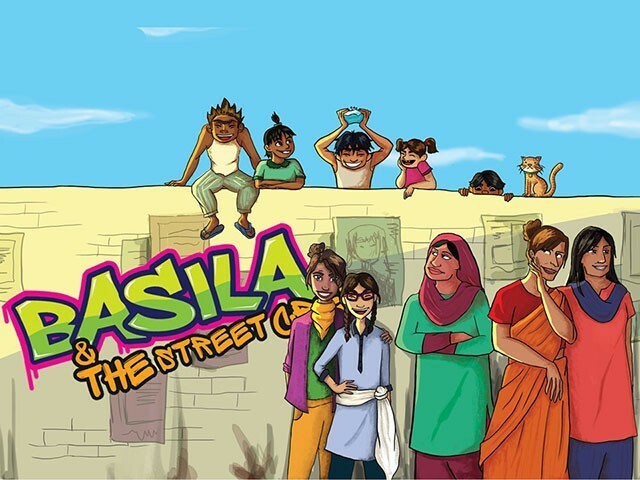 Basila, is a one girl crew, who takes upon herself to teach homeless aspiring artists to pursue their passion through painting visual messages of love, peace and interfaith harmony on public walls and open spaces. Streets of Karachi are her classrooms and the city walls are her canvas. Participate and contribute in our monthly activities with schools and children in marginalized communities. Build alliances and make a difference. Support us in disseminating meaningful messages.